Glendenning, Burton. "St. Thomas University". The Canadian Encyclopedia, 02 November 2017, Historica Canada. https://www.thecanadianencyclopedia.ca/en/article/saint-thomas-university. Accessed 19 April 2019. 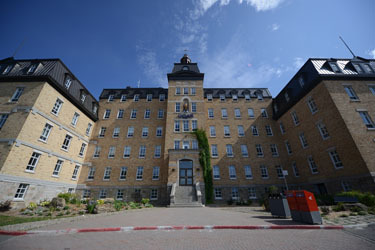 St. Thomas University, in Fredericton, NB, evolved from the Roman Catholic school system in the province and more directly from Saint Michael's Academy in Chatham. St. Thomas University, in Fredericton, NB, evolved from the Roman Catholic school system in the province and more directly from St. Michael's Academy in Chatham. Although this school, opened in 1860 by Bishop Rogers, lasted only until 1880, it left behind physical and intellectual structures and a community desire for a local college. However, despite extensive efforts on the part of successive bishops and the clergy, it was not until 1910 that the Basilian Fathers opened St. Thomas College, a high school and junior college. This order relinquished administration to the Diocese of Chatham in 1923. The college obtained degree-granting status in 1934 and ceased to teach high school in 1961. In 1960 the name was changed to St. Thomas University and in 1964 it moved to Fredericton to occupy a portion of the campus of the UNIVERSITY OF NEW BRUNSWICK and to share some of the same facilities. The university grants undergraduate degrees in arts, journalism, social work and education and certificate programs in criminology and social justice, social work and gerontology. Research centres include the Atlantic Human Rights Centre and the Third Age Centre. 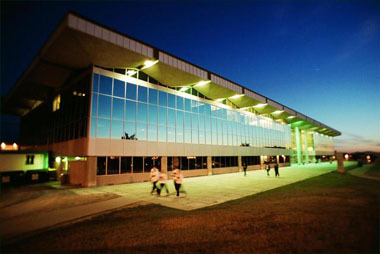 About 2000 students are enrolled full-time and 300 part-time at St. Thomas University. Saint Thomas University The official website of Saint Thomas University.